This is a story of two currents. One that destroyed and the other that saved. Both were mammoth and moving. How the most unexpected and unprecedented-in-half-a-century massive flood devastated millions of lives, destroyed crores worth of property and devastated hundreds of acres of cultivable land in one of the most populous and least developed states of India - Bihar, in the second fortnight of August 2008 is a shocking story, to say the least. But what is equally astounding is how an Organisation consisting of a band of absolutely selfless workers plunged into this catastrophe without losing a second, to provide hope, succor and comfort to thousands who had resigned to their cruel fate and hopeless ends. They did not eat or sleep for days, and braved damage and death to ensure that their brethren are safe. This is a story of human empathy that flowed as swiftly as the speeding waters, giving true meaning to the most pious emotion of this universe - 'love'. The New York Times reported it as the worst flood in the area in 50 years; their headline pronounced: "Millions displaced by floods in India." The Prime Minister of India declared it as a "national calamity" on August 28, 2008. The Indian army and non-government organizations operated the biggest flood rescue operation in India in more than 50 years. More than 2.3 million people were marooned. At least 2,47,000 acres of farmland were swamped destroying precious crops of wheat and paddy. The ravaging waters gushed in at 25000 cubic meters a second and thousands were washed away even before they realised what was happening. Over 800 villages, 1000 individuals and countless families were destroyed. It was unprecedented, unexpected and the most ruthless devastation the state had ever seen in half a century. This is the sorry story of what unfolded in the one of the least developed and most populous states of India – Bihar, in the second fortnight of August 2008. In a matter of a few days from August 18 – when the people of India elsewhere were still upbeat after celebrating a lively Independence Day on August 15 – thousands of poor folk in Bihar were running for their lives, literally. Leaving behind their homes and belongings, helplessly they sprinted as if possessed by a devil to find areas of safety; it was as if the God of death was after them. "Yes, it was not an ordinary flood, it was like a Maha Kal (a terrible wrath of the God of Death)," asserts Mr. S. B. Chaudhury, the State President of Sri Sathya Sai Seva Organisations of Bihar. "Floods in Bihar are not uncommon," he adds and continues, "Every year the River Kosi flows into the inhabited lands of Bihar and destroys crops and property. 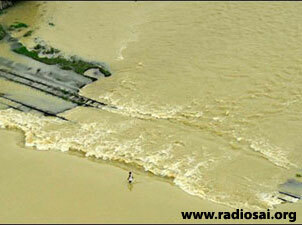 This river, as it is often called, is truly the 'Sorrow of Bihar'. But the people on these occasions are not taken by surprise; they are prepared for it. But what happened this year is shocking; it caught everybody unawares. The River broke its embankment at Kusaha in Nepal and through a huge 2 km breach in the dam, picked up an old route it had abandoned over 100 years ago! On the night of August 18, a huge wall of 22 feet of water started rushing in furiously and washed away everything - buildings, people, cattle, castles, trees, etc. – that came on its way. For all we know, the 1000 deaths might be an underestimate. 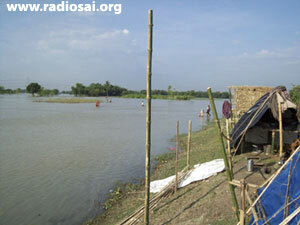 Thirteen districts were affected, but in four the damage was severe; in Supaul it was the worst." 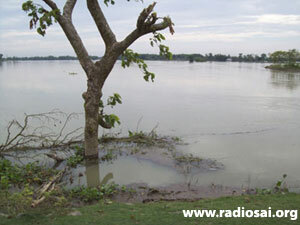 "Yes, it was not an ordinary flood, it was like a Maha Kal (a terrible wrath of the God of Death)"
Mr. Shiv Shankar Choudhury, the District President of the Sai Organisation of Supaul, rushed to the site of devastation as soon as he heard the news. 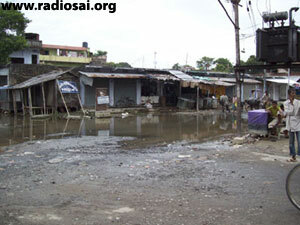 "We took motorcycles and rode immediately towards the affected areas. What we saw there was simply pathetic. A middle-aged man was running carrying his children on his shoulders; an old man rushed as fast as he could with a tiny bag of belongings on his head; a third was trying to save his cattle; the fourth had tied a little food in a torn towel and was rushing crying out aloud as he had lost everything…. The flood waters were closing in at a fast pace; they had no time to think. They were just running piteously to elevated areas. Tears started streaming down our cheeks… People were now living on trees; they had nothing to eat or drink, except the polluted water that pervaded them on all sides." "The flood waters were closing in at a fast pace; they had no time to think. They were just running piteously to elevated areas. Tears started streaming down our cheeks… People were now living on trees; they had nothing to eat or drink, except the polluted water that pervaded them on all sides." 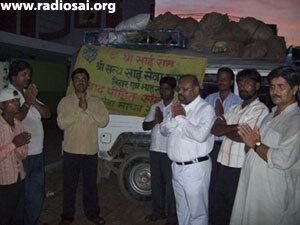 Shiv Shankar and other members of the Organisation returned and immediately started preparing for relief work. The government and other non-governmental organisations, who were ill-prepared for a calamity of such magnitude, were still trying to come to the grips of the situation. Meanwhile, the spirited Sai volunteers collected essential food items and on the night of August 21, served more than 2000 people. They went into villages which were completely marooned and where approachability was very poor. In fact, it was highly risky to visit those remote pockets of inhabitants. "Yes, it was a perilous adventure and we did not even have regular boats; we had to make use of country boats," recalls Mr. Shiv Shankar, and adds, "The current of the water was so high that if you stood on two feet of water, you would surely be washed away. In fact, the police and government authorities were stopping people from going into those areas. 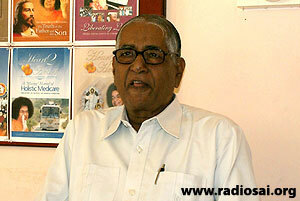 But, we were not afraid because we were absolutely confident that Bhagavan is with us. That is why Sai Organisation was the first to start relief work and we started with really remote areas where people were stranded on trees and elevated structures. Loaded with poha (beaten rice), jaggery, biscuits, milk, salt, candles, bread, clothes and medicines, we rowed kilometers on the rickety boats and reached out to the distressed. 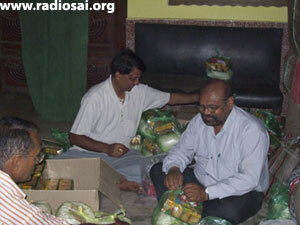 We had no fear; Bhagavan gave us the strength and we distributed all these items as His prasadam (gifts)." 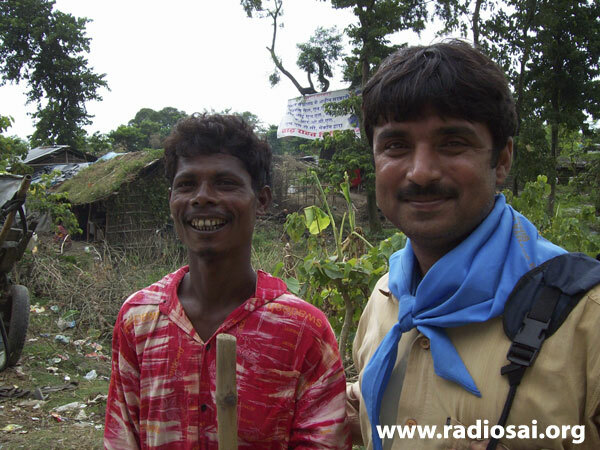 "That is why Sai Organisation was the first to start relief work and we started with really remote areas where people were stranded on trees and elevated structures. Loaded with poha (beaten rice), jaggery, biscuits, milk, salt, candles, bread, clothes and medicines, we rowed kilometers on the rickety boats and reached out to the distressed. 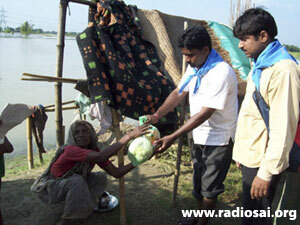 We had no fear; Bhagavan gave us the strength and we distributed all these items as His prasadam (gifts)." Twenty sevadals served from 9 o clock in the night till 4 in the morning with the help of torches. 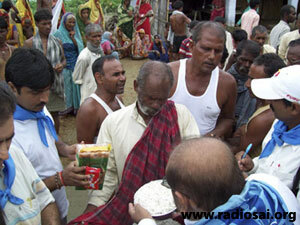 They located every individual seeking help in the destroyed zone of Supaul and offered them food and clothes. 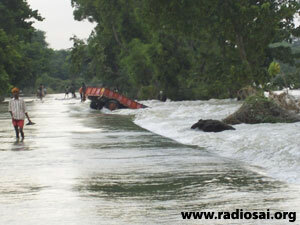 If this was the situation in Supaul, it was no different in Madhepur, another worst-affected district. "When we surveyed this area on 23rd, we found that water had entered into the offices of the District Collector and the Superintendent of Police," says Mr. Ram Avatar Razaq, the District President of the Sai Organisation of Madhepur. "In fact, the entire capital town of the district was a sea of water. We found people perched on top of buildings and on elevated embankments. They were hungry, crying, shocked and devastated. When we filled their desperate palms with food carrying love in our hearts and the name of 'Sai' on our lips, they cried copiously. Overwhelmed with gratitude, they too vociferously chanted 'Sairam!' It was three days since their lives had turned completely upside down and nobody had come to their rescue. Since we served each one of them personally with lot of dignity and concern, they started treating us as if we were gods." All he needed was something to eat - So happy to receive the biscuit pack! Were there not other Organisations doing relief work? "Yes, they were," clarifies Mr. Ram Avatar, and adds, "But they would not venture into risky areas. 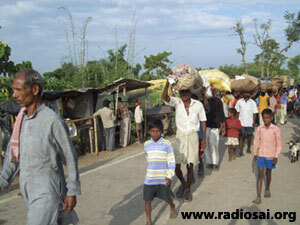 For example, the village, Rampur, was 30-35 kilometers from Madhepur. It was completely covered with water, and all the people had taken shelter on an elevated land; they were anxiously waiting for relief but nobody would go there. In fact one of the government boats was drowned while making an attempt. But with the name of Sai in our hearts and the continuous chanting of Sai Gayatri, we rowed into that danger zone with loads of food and other essential items. 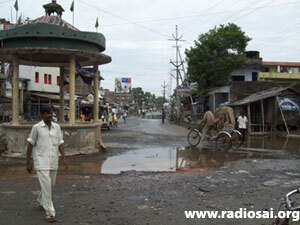 "The village, Rampur, was 30-35 kilometers from Madhepur. It was completely covered with water, and all the people had taken shelter on an elevated land... But with the name of Sai in our hearts and the continuous chanting of Sai Gayatri, we rowed into that danger zone with loads of food and other essential items." There was a huge crowd waiting eagerly standing on a single piece of high land and surrounded on all sides by water. When we reached out to them and distributed milk, biscuits, rice and clothes, their sense of relief and joy knew no bounds! And Rampur, mind you, was not the only such location, there were plenty and we went to many such remote and completely isolated villages like Murliganj, Tunahi, Sukhasan and Garibtola. This was our continuous activity for days and weeks." While individual districts started relief activities immediately as a spontaneous reaction to the calamity on August 21, the State President of Sai Organisation felt the need to coordinate and organize the efforts more systematically to sustain the momentum of the good work. Hence, he called for a meeting of all the district presidents on the 24 th. 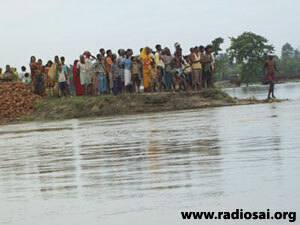 After this session, supplies to the affected areas started arriving from more than 30 districts of Bihar and Jharkhand. 30 truck-loads of essential items came in immediately, and meanwhile, with the direction of All India President of Sai Organisations, neighbouring states too started sending in truck loads of materials. "Now, resources were not a problem," says Mr. Chaudhury, the State President. "Many states joined in. The state of Maharashtra sent vitamin biscuits for small children; and rice and dal, soaps and tarpaulins, sarees and dhotis came in from Delhi, Uttar Pradesh, Haryana and Punjab. 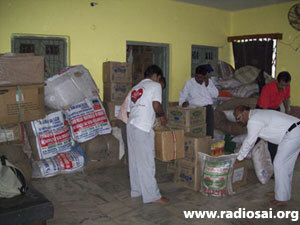 Similarly, other essential food items and clothes arrived from Madhya Pradesh and West Bengal. What was needed at this point was proper organisation of packaging and distribution. For this purpose, we created a base camp at Saharsha because this was the only place from where all the affected districts could be reached at the earliest. 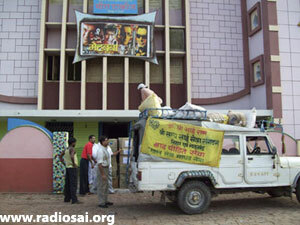 A theatre owner in Saharsa offered two big rooms and it was here that 50 Sai workers worked tirelessly every night for days and weeks making individual packets of all essential supplies. Each bag contained a minimum of 2 kilograms of beaten rice, jaggery, biscuit packets, milk powder, soaps, candle, matchbox, common medicines, clothes and other small items. Early in the morning everyday, a truck load of such packets were ready and a team of youth carried them to the distressed areas. 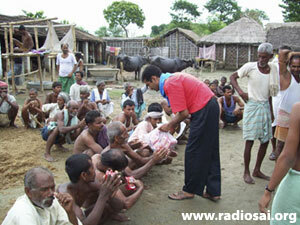 To give you one instance, our Sai Youth went to a completely marooned village called Sukhasan. Now, this hamlet was covered with three kilometers of water on all sides. When our devotees reached there with lot of difficulty on the country boats, the people there started crying out of joy because they said, 'Nobody has bothered about us till now; we have been suffering for so many days.' They felt 'there is somebody who has not forgotten us' and we told them it is Sai Baba who is concerned about you. They had never seen a picture of Bhagavan earlier, but now whenever we go there, in joy they exclaim 'Sai Baba has come, Sai Baba has come'. 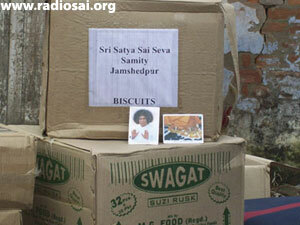 "Our Sai Youth went to the remotest of areas and delivered the items wherever they were. Like all Sai activities, we did all of this with great reverence and love for the unfortunate ones." What needs to be highlighted here is that while there were many other agencies engaged in relief and rehabilitation work, their efforts were restricted mainly to the towns and the areas that were easily accessible. They asked the people of affected areas to come to the urban areas to collect the supplies, but our Sai Youth went to the remotest of areas and delivered the items wherever they were. Like all Sai activities, we did all of this with great reverence and love for the unfortunate ones." Mr. Srinivas, a Sai Youth from Jamshedpur, adds, "I went with the first big consignment from our city to Saharsha on August 29. The next morning, when we went to the affected areas in Madhepur, I was utterly shocked. The district head quarters was completely inundated; it was a such a sorry sight because there were shops on either side of the main road, or rather which had been the main road, because now, there was no road; it was covered with two feet of water! People were moving about on boats. 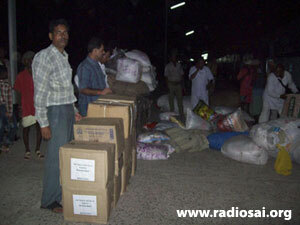 Soon we reached the relief camps and other affected areas. At every place, we first made everybody – children, ladies and gents - sit in neat rows and only then started the distribution chanting Swami's name. What generally happened in such situations, with other organisations, is that there would be a stampede, and then many items would be either destroyed or lost because of grabbing and fighting. But we treated them with love and they responded well too. We ensured that there is discipline and calmness during distribution so that everybody got his/her packet." "It was not difficult for us to immediately strike a chord with the villagers because we are used to serving in the rural areas all the year around," explains Mr. P. V. Krishna Mohan, an alumnus of Sri Sathya Sai University and now Jamshedpur Sai Youth Coordinator. "We understand them very well. Besides, because of our experience in disaster and relief management, we were among the first organisations to get into the rescue act. And our focus was on the villages and isolated areas because it was these areas which no other organisation was venturing into." "I cannot forget Garibtola," adds Mr. Ram Avatar Razaq. "It was so risky to get there. The river was overflowing; at places it was very deep. Our boat was literally rocking dangerously; we could bang into anything and turn upside down. It was due to His sheer Grace that we reached that village which had now become an island. We saw people sitting on raised platforms and trees; they were probably living in that situation for at least ten days. They drank the same flood water as they had no choice. 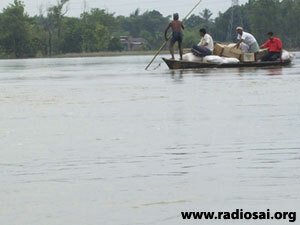 The government helicopters did drop relief material, but many a times these fell into the river. "Once we reached there, we personally distributed food, clothes and medicines to women, children and the adults. 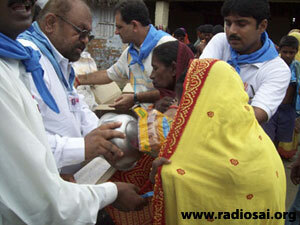 Throughout the day, like during many other days, we were so occupied with relief work that we forgot hunger. 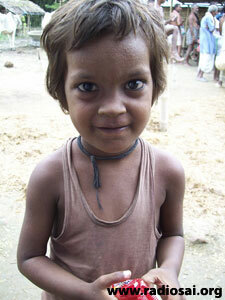 We used to eat only after we returned to our base camp in Saharsha in the midnight. "But the challenges were different in every area. In another village, Rampoortola, we traveled on knee-deep water for 40 kilometers in our jeep, and after that there was absolutely no road. So we walked another 3 miles carrying all the relief material on our shoulders. In fact, a few of our volunteers and the villagers had to acts as security guards with sticks because there were people in the towns who looted the supplies. We did finally manage to reach the completely devastated village. Our hearts broke when we saw the sight there. The children were crying; the women had lost all hope – you could see the emptiness in their eyes, and the men folk were hungry and helpless. They had received messages from other organisations to go to the towns for food, but they had no energy or hope. When we served them food, they were still dazed; they could not believe that somebody had actually come to their destroyed village and was concerned about them. "They had received messages from other organisations to go to the towns for food, but they had no energy or hope. When we served them food, they were still dazed; they could not believe that somebody had actually come to their destroyed village and was concerned about them." I was so grateful to Bhagavan at that moment for having blessed me with that opportunity to help those poor souls. I did see God in each one of them, and with that feeling I wiped their tears. I had never before experienced the bliss of serving and giving like I did that day. This entire project has been such a powerful and divine experience for me." "I sincerely felt that it was God who was reaching out to another form of God," says Mr. Shiv Shankar Choudhury, the other district president. "The grueling five weeks of service was like a penance for me. I used to get up at 4 every morning and sleep only after midnight. At 6.30 a.m. every day we started with our loaded trucks and returned not before 10.30 p.m. After that I had to attend to other organizational and paper work to ensure that the supplies are properly received and packing went on smoothly, apart from preparing official reports. On many days, the only food I had during the whole day was a biscuit packet. I have no idea from where the energy came from. If none of us have fallen ill, it is purely His grace. In fact, we felt His love and protection every single day." Now, Mr. Ram Avatar takes over again. "Yes, I remember, on August 28 evening, when we were returning with left over relief material on our truck, it started raining heavily. 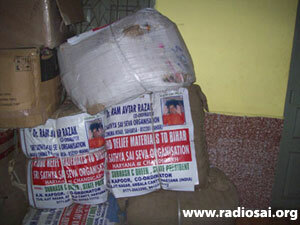 Our materials were not covered; they were in jute bags. We intended to distribute them on our way back. 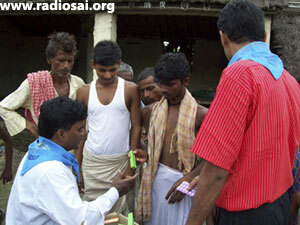 At 9 p.m. when we stopped at a town called Jitapur, we were shocked to see that none of the packets were wet! We immediately brought them down and distributed it to the people of that area. 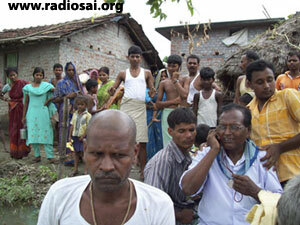 There was one building which had survived the flood in Jitapur and that government shelter was crowded with people. 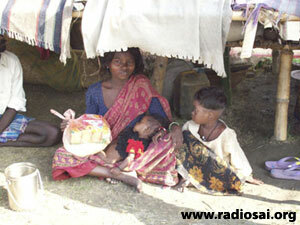 They were needy and too delighted to receive our food and clothes." "Instances of His Grace are numerous," continues Mr. Shiv Shankar Choudhury. "When the dam breached on August 18 near the Indo-Nepal border, one of the villages which was terribly destroyed was Dirpul. 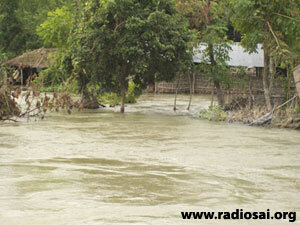 None of the houses – old or newly constructed – in that village could withstand the ferocious water current, except one. "It was a family of Sai devotees; they climbed onto the roof of their house. Their faith in Bhagavan was so strong that they had no fear. The water rose to 20 feet but they, along with their house, were safe. They stayed on their roof for 10 days and once the water receded, came down the stairs and found all things in their house intact! 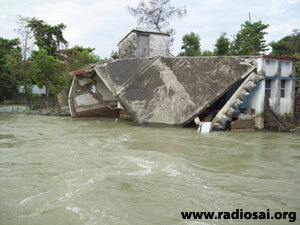 "There is another incident of how Swami amazingly saved a boat full of people. 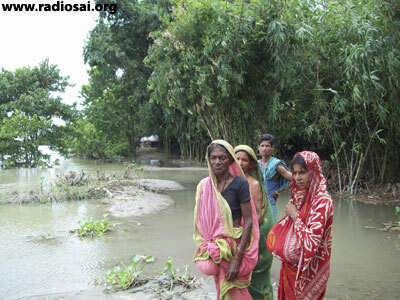 The sister of one of the Sai devotees was trapped in a flooded area. 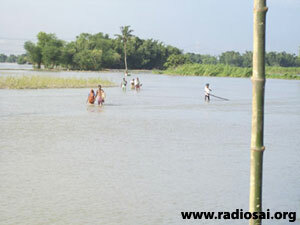 This area was 40 kilometers from Supaul. We were unable to reach her in spite of our best efforts for many days. And then suddenly, on the eighth day, she called up from her mobile. "We were taken aback. Her phone, by providence, had started working after more than a week! Then, we arranged for a military boat to go to her rescue. As the vessel moved, it found a lot of people on the way seeking to be helped, so it got all of them on board. Slowly, the number increased and by the time the boat reached his sister, there were already 80 people inside; there was no room for her. "So the vessel turned, promising her to return for the second trip. On the return journey, suddenly the engine of the boat stopped functioning. It was a precarious situation because the water current was very high. We were worried and started chanting Swami's name. Next, the boat hit the pillar of a bridge, and was tossed back and forth by the ravaging waters. It again banged into another concrete post. Mind you, these were really hard collisions, but somehow the boat was not destroyed. And fortunately during this process, the vehicle got stuck to the bridge. Then the military personnel on the bridge got immediately into action and dropped ropes. Soon, all the people were saved. After two days, the devotee's sister too was rescued. It was prayer alone which saved so many lives, quite mysteriously, that day. Baba says 'I am the Indweller' and we felt His presence in so many ways." Mr. Krishna Mohan, the enthusiastic Sai Youth who works in Telco Company, Jamshedpur, says, "This chance to serve blessed us with a higher level of self-satisfaction because we felt we were offering service not to people, but to different forms of God. 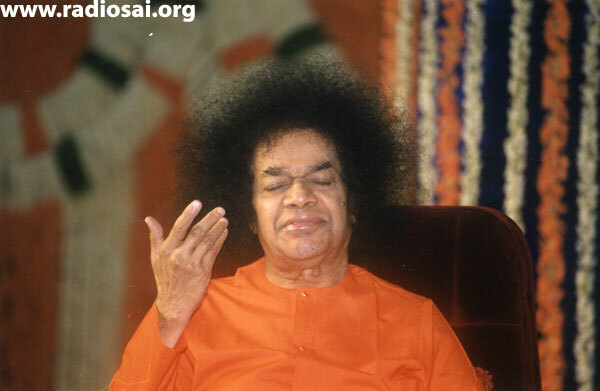 More than the bliss of being use to others, it was an eye-opener too to many people in the Sai Organisation and beyond. I sent out an email to all the employees of our company informing them of our service initiative, and so many came forward to help. They were shocked when we showed them the pictures and video clips of our work. The ideals of the Sai Organisation moved them. It shook their beliefs and they came out of their comfort zone to help the distressed wholeheartedly. This transformation in their outlook is something very valuable to themselves and to the society at large. Therefore, there were such silver linings too to this dark cloud of disaster." 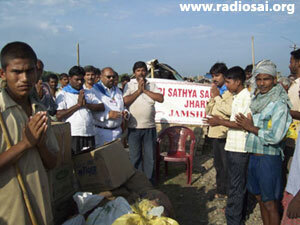 The relief work that started in right earnest in August 21, 2008 continued for five weeks benefiting 50,000 people in the worst affected districts. "Once the water receded completely and people returned to their respective villages, we distributed them special kits to help them rebuild their lives," says Mr. S. B. Choudhury, the State President of Sai Organisation of Bihar. "These comprehensive packs which had cooking utensils, serving plates and spoons, blankets, 20 kilograms of rice and other food grains, sarees and dhotis were gifted to them before their festival day of Diwali which fell on October 28. The joy in their faces is to be seen to be believed. For us, there was no other way we could have celebrated this festival of lights better." Truly, we shine brighter when we lend our lives to others. The Sun is glorious because it gives itself to others incessantly. And walking in this sunlight path of selfless service, the volunteers of the Sai Organisation of Bihar have experienced true bliss; they were able to fathom the source of genuine joy. The magnitude of their service may not be mammoth when compared to the colossal devastation that this poor state saw, but at the end of this sacred exercise, Sai workers grew richer by enriching the lives of how many ever they could in the best manner possible. 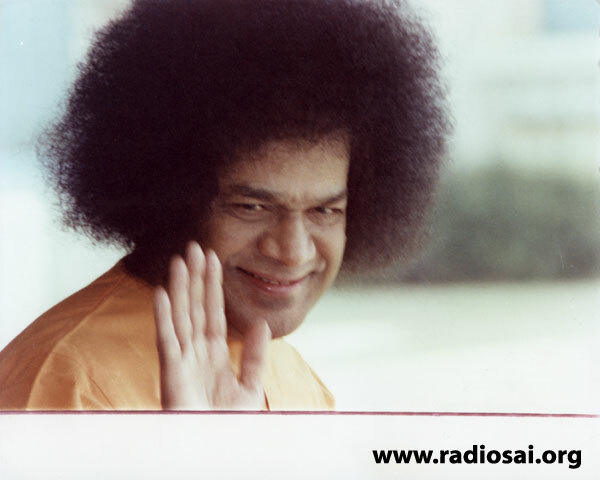 It was simply Pure Love in action, inspired by Pure Love Incarnate, Bhagavan Sri Sathya Sai Baba.